For our first full day in Orlando we were headed to the Magic Kingdom. 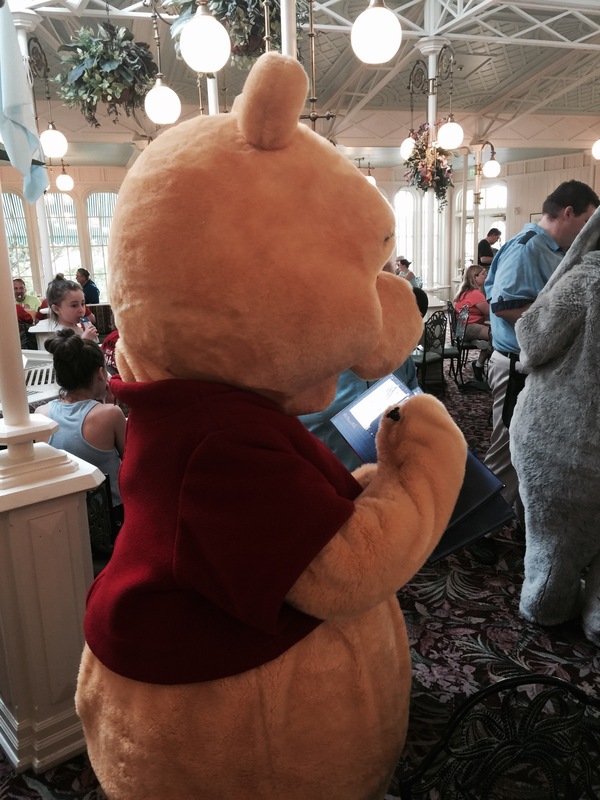 We had a character breakfast scheduled at the Crystal Palace with Winnie the Pooh and his friends. However we got to the park earlier than expected (thank you Monorail), and my sister and brother-in-law wanted to hit up Space Mountain. After getting through security and using our MagicBands to enter we were immediately greeted at the town square by Pluto and Minnie Mouse. Unfortunately the line for Minnie Mouse was huge so we wait for Pluto. 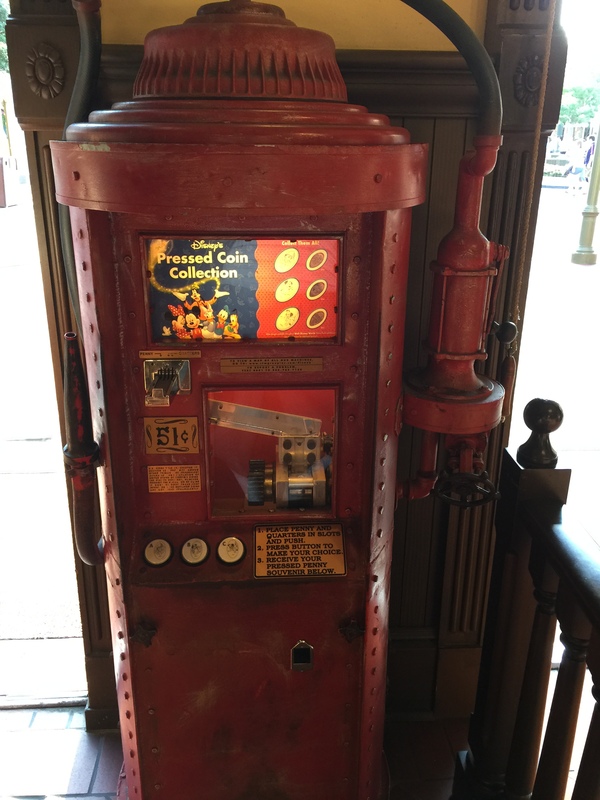 While my family waited for Pluto I quickly ran into the Main Street Train Station to use the two machines located inside. They are located on the street level behind the stairs to go up to the platform. 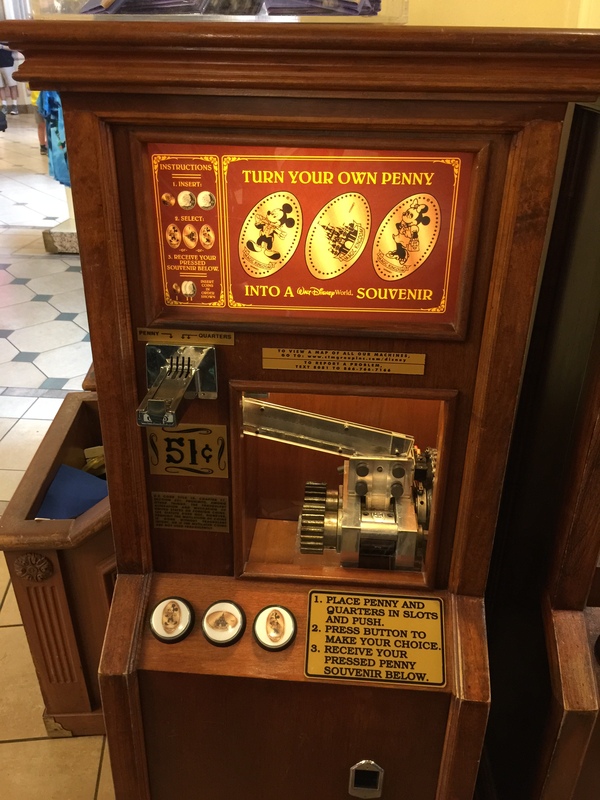 The penny machine I had already acquired the designs and just need a picture of the machine. 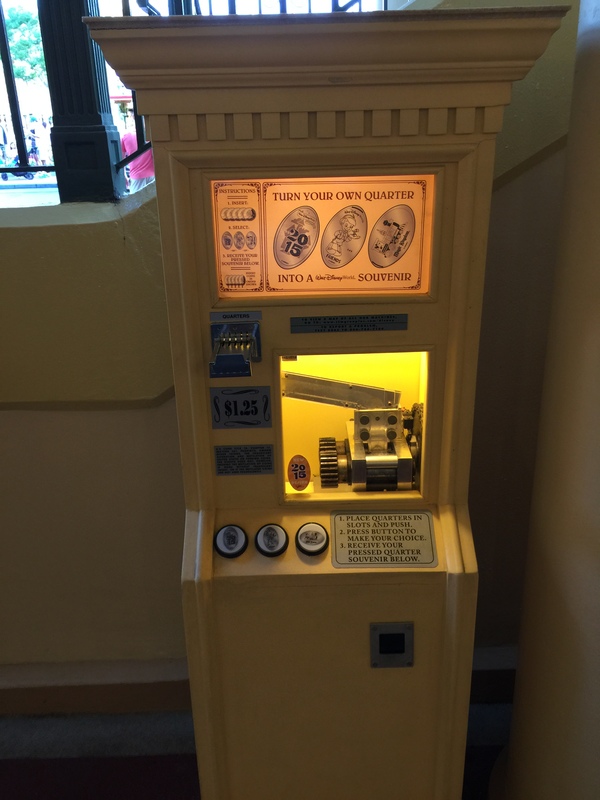 The quarter machine did have one of the new 2015 designs with Cinderella’s Castle. 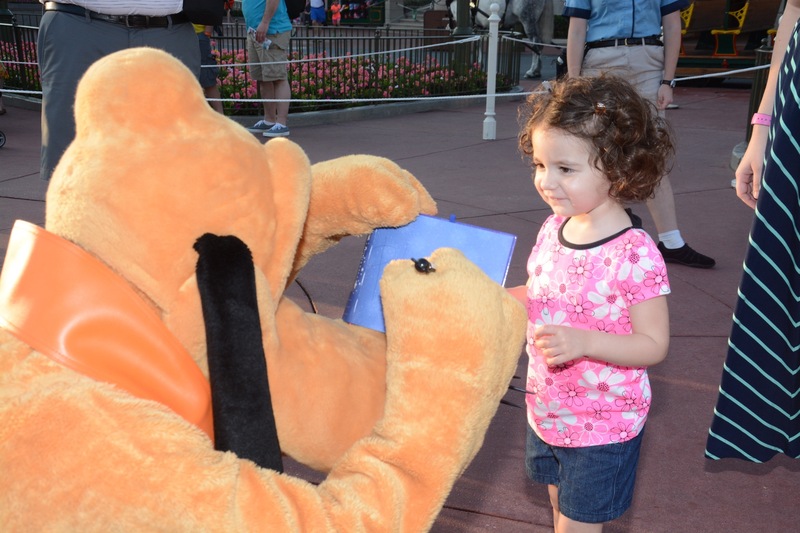 I pressed this coin and made my way back over to Pluto just in time for my daughter to meet him and get his autograph. 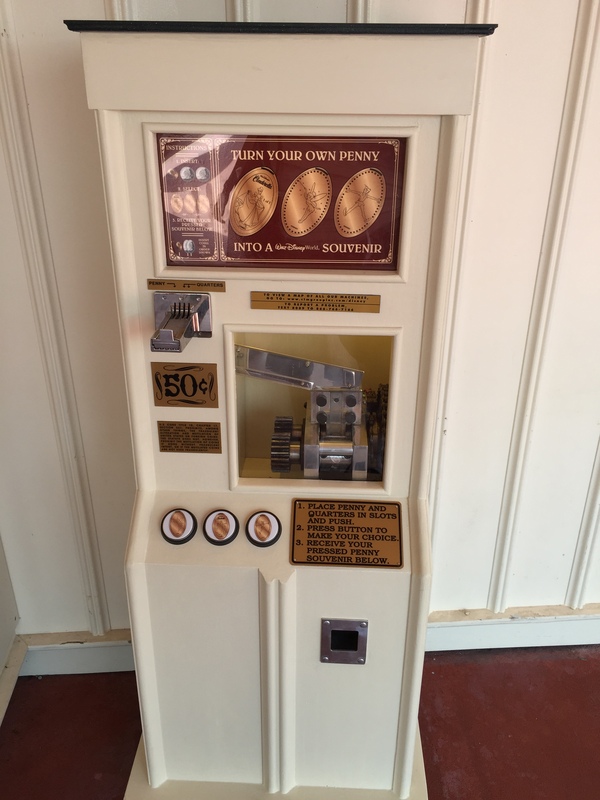 After Pluto my family started heading up Main Street and I quickly headed over to the Main Street Firehouse and got an updated picture of the machine that was put back on display here. It has been there a few years ago during my last visit but had been taken away for some reason. 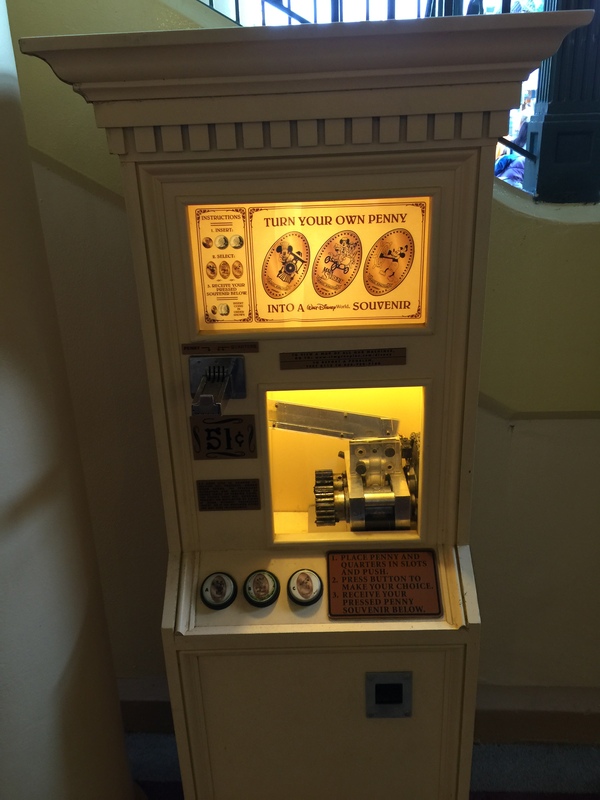 This machine has 3 designs each with different Dalmatians from what else the Disney classic 101 Dalmatians. I already had these designs but pressed new ones since my originals were on old dirty coins before I was a little more picky about what I used. I walked quickly to catch up with my family just in time to take a picture of all of us in front of Cinderella’s castle. Then we headed into Tomorrowland and up to Space Mountain. My wife and I are not big ride people so my sister and brother-in-law went ahead by themselves. My parents were watching the kids plan with a cast member shooting bubbles into the air and this was keeping them quite entertained. I headed into the Space Mountain gift shop for the next machine on my list. 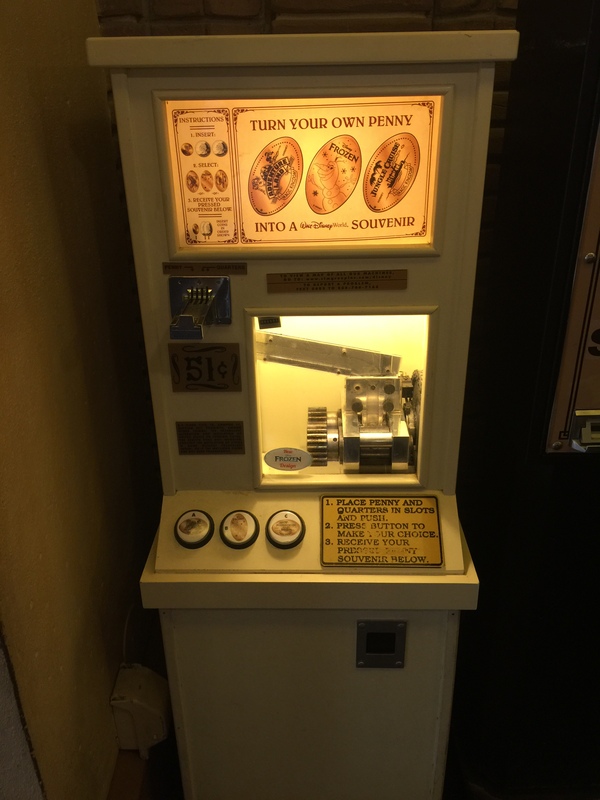 There are actually 3 machines located inside this store and one of them actually presses dimes which is unique. Two of the machines hadn’t changed so I only need the quarter machine. The 3 designs are all Space Mountain themed and look really great on the larger size quarters. Next I headed across the courtyard to Mickey’s Star Trader. 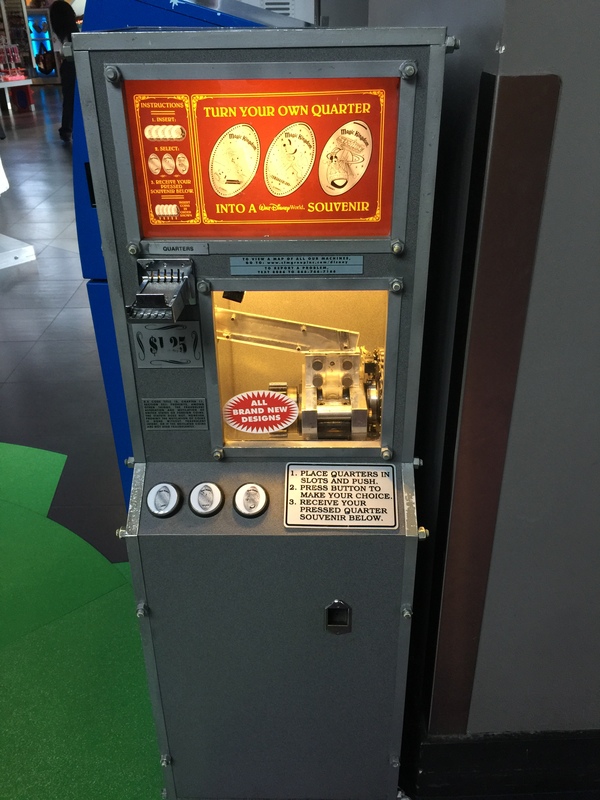 This was another quarter machine with 3 designs. The designs included 2 Tomorrowland images and one of Zurg from Toy Story. I crossed through this store and out the back towards the Indy Speedway where another machine was close by. 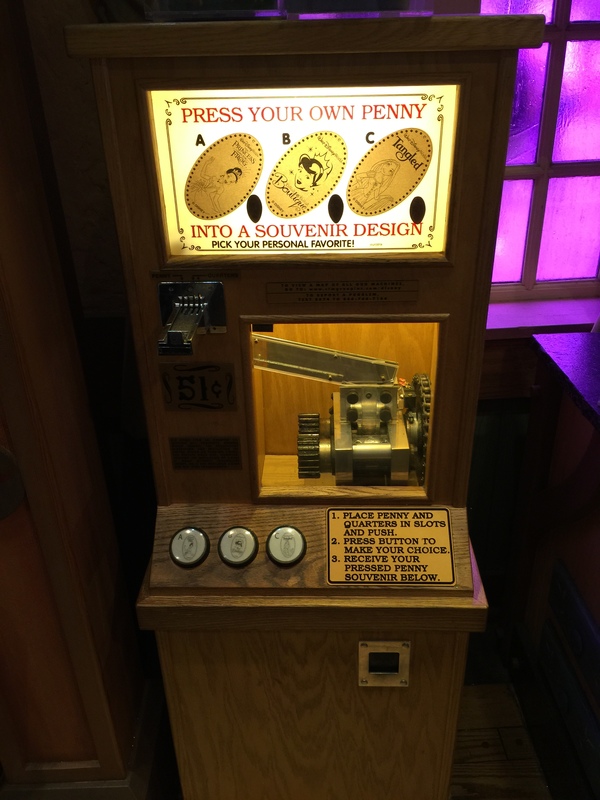 Unlike most of the machines in WDW that are electric and just require your money and the press of a button this was a hand crank machine with 4 designs. These designs were also very detailed and included racing themes with Goofy, Mickey, Minnie and the Indy Speedway logo. Hoping my family wasn’t waiting around for me I quickly headed back towards Space Mountain but found the kids were still playing with the bubbles and my sister was just exiting the ride. They took a picture on their phone of their official Space Mountain photo and after we laughed for a good couple of minutes we figured it was time to head back for our Breakfast reservation. The Crystal Palace is a pretty standard breakfast buffet with the usual Mickey waffles, scrambled eggs, omelet station, etc. But who are we kidding we were really there to see Pooh and his Friends. During the course of our breakfast we met Pooh, Tigger, Eeyore and Piglet. Their interaction with the kids was really great and we were able to get some fantastic pictures. Now that we had filled up our gas tanks we were ready to start exploring the rest of the park. We started in Adventureland and jumped on the Jungle Cruise. With the Jungle Cruise successfully completed I crossed the path to the restroom area know as the Verandah Breezeway. There is a machine over here that was calling my name. The machine had a new Frozen design that I already had collected but needed an updated picture for my files. The designs include the Adventureland logo, Olaf from Frozen, and the Jungle Cruise boat. After that we headed towards Aladdin’s magic carpet ride. My family waited inline for the ride and just as they got on and started flying an announcement was made that they were coming down for some reason. Not sure if the ride malfunctioned or not, but they were escorted towards the exit but asked not to leave they would be put back on in a few minutes. I took this opportunity to cut through a pathway over to Frontierland where the Shooting Arcade was located. 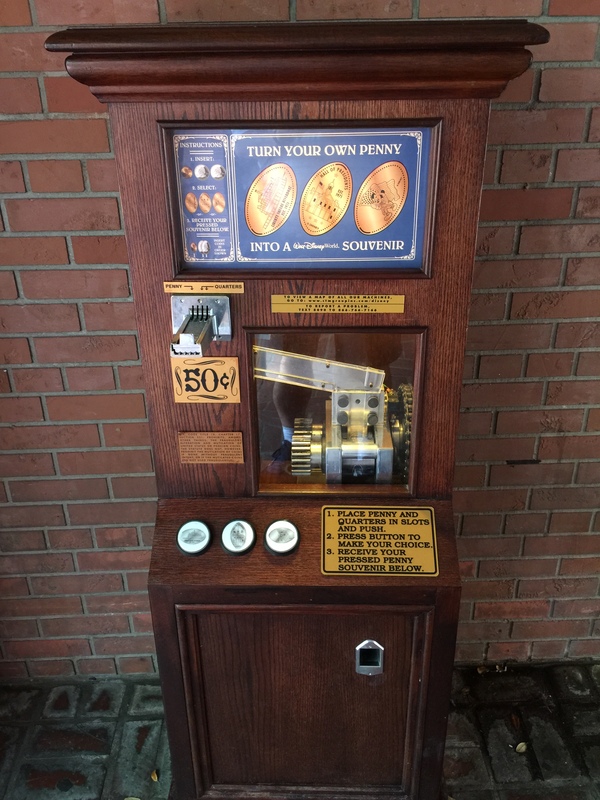 I used to love this as a kid and remember my grandfather pumping quarters into it for me. There are two machines located here. 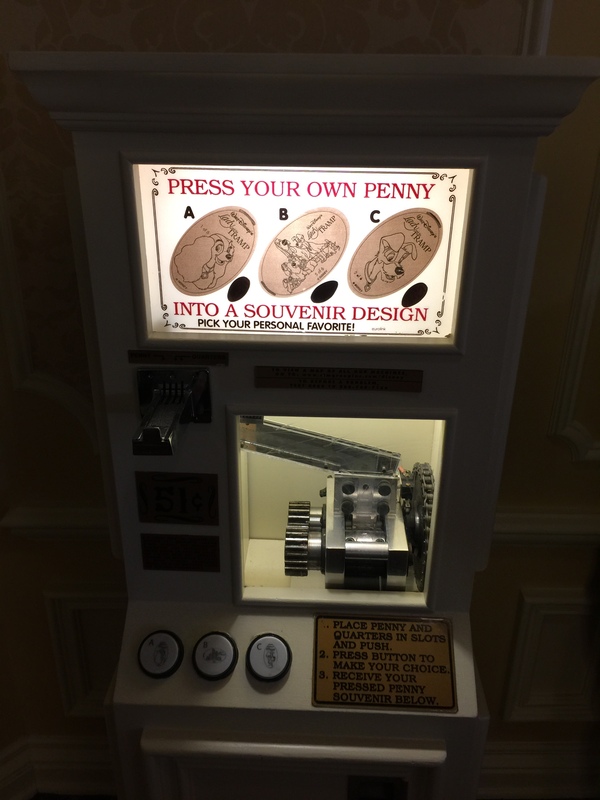 The first machine had classic face designs of Mickey, Donald and Goofy. 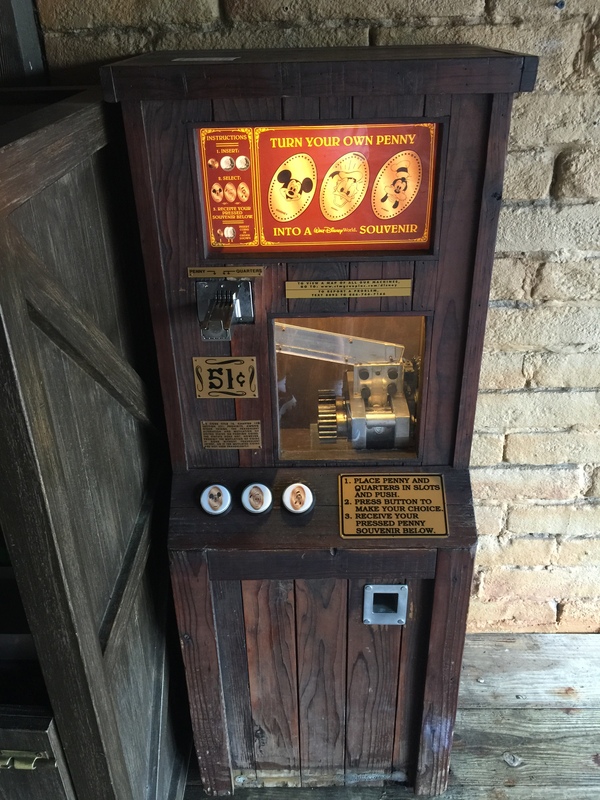 The second machine has Cowboy Mickey, Woody from Toy Story, and Cowboy Donald. I headed back towards the Aladdin ride and found my family still waiting to get back on the ride. I took this opportunity to check out something I had been told about but in all my visits never tried yet. Dole Whip! All I have to say is WOW, I don’t know how I ever missed this before. From my understanding Dole Whip is a non-dairy ice cream like concoction. The original flavor was Pineapple, but I believe you can now get orange. I didn’t even bother with the other flavor as I was hooked on the pineapple. I started with just Dole Whip in a cup, but upon later visits back to this stand I tried the float which was even better. 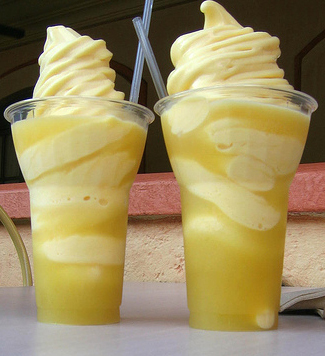 They fill a larger cup half way with pineapple juice and then pour in the Dole Whip. Truly amazing I even found a Dole Whip air freshener for my car in a gift shop, it’s not quite the same but as close as I can get in Jersey. The only thing is that you can only get these a couple of places through the entire resort. This one in Magic Kingdom, at the Polynesian Resort, and at Tamu Tamu in Animal Kingdom. 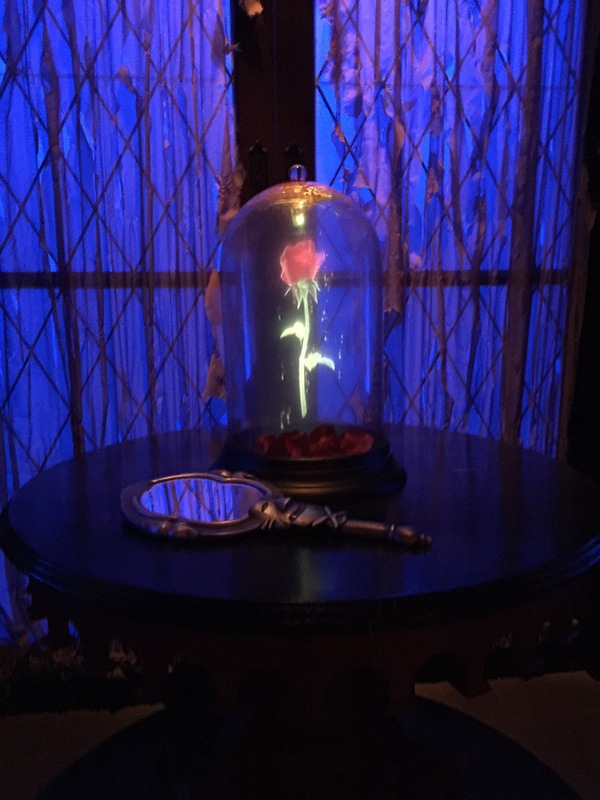 Above is the famous Rose from the movie Beauty and the Best with falling petals and all. After lunch we headed towards the Big Top Circus area so the kids could check out the Dumbo ride. Unfortunately Hanna was getting tired and was getting cranky. While my brother-in-law look my niece on Dumbo I took Hanna in the stroller for a walk to try to see if she would fall asleep for a nap. We headed into the Big Top Souvenirs tent and I found the next machine on my list. This machine was another 4 design hand crank model. The four designs are all circus related with the usual Disney character. Strongman Donald, Trapeze Minnie, the Great Goofini, and Ringmaster Mickey. After leaving the tent Hanna was still on the cusp of going to sleep so I look her for a stroll back towards Cinderella’s castle to check out some other machines. First we went into Sir Mickey’s which is a narrow little store that has the usual gifts and things to buy. The machine was located right near one of the check out counters so it was a little crowded to try to use. 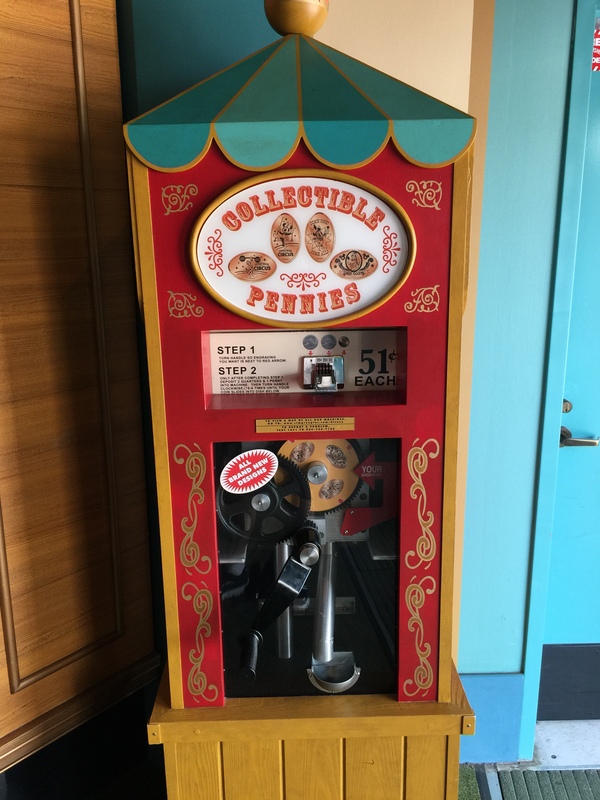 The machine has 3 penny designs. 2015 Sorcerer’s Apprentice Mickey, Snow White, and Elsa from Frozen. We walked across the crowded walkway to the adjacent store called Castle Couture for another machine. Another 3 penny designs included: Tiana from The Princess and the Frog, Bibbidi Bobbidi Boutique, and Rapunzel from Tangled. With these coins pressed I checked Hanna and she was fast asleep. I headed back over towards the Big Top Circus and the rest of my family was watching my niece Ava ride on Dumbo. After she got off my family had decided they wanted to head back to the resort for a rest before coming back for dinner later on that evening. My wife and I decided to stick around the park for a little while longer and my parents were happy to watch a soundly sleeping Hanna until we got back to the resort. There were a few rides we did want to check out along with some more machines I needed to visit. As we separated from the rest of our group we headed to the Flight of Peter Pan ride which we had another Fastpass for and got on with almost no wait at all. 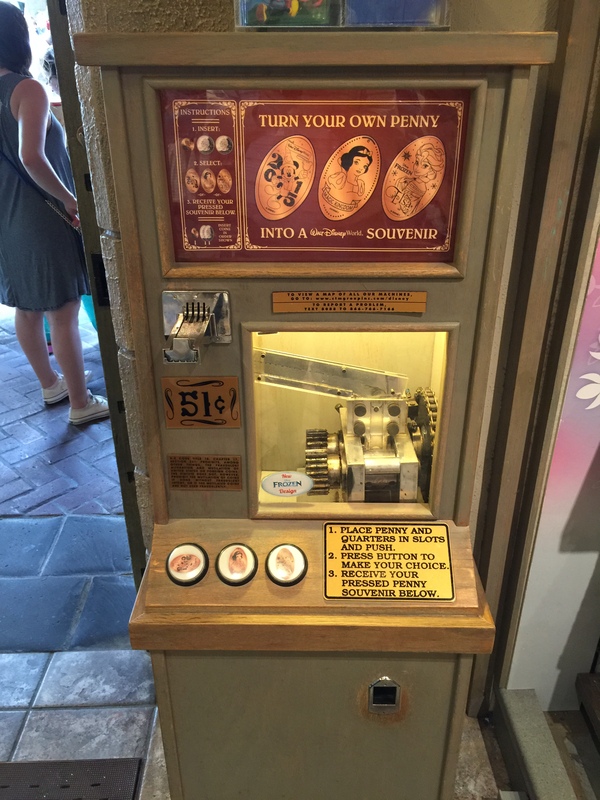 After that we headed towards the Haunted Mansion another favorite of ours but the standby wait time was over 50 minutes so we skipped it but did find the new penny machine. 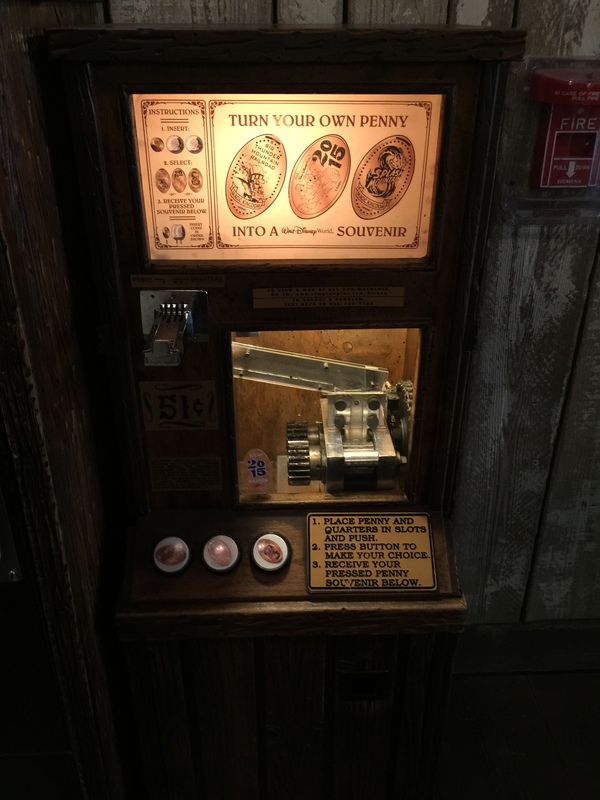 This machine was located just a little past the Riverboat station outside the Haunted Mansion. 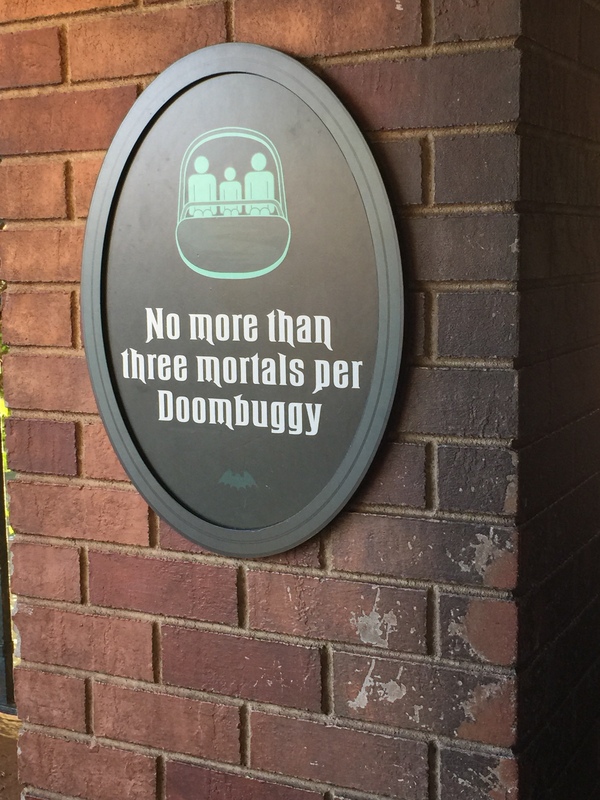 It had four designs that included the hitchhiking ghosts. Do you know their names? Ezra, Phineas and Gus (I had to look these up), the fourth design is of Mickey, Donald and Goofy dressed like the hitchhiking ghosts. This next machine was also new and I didn’t know exactly where it was located and took a little wandering to find it. 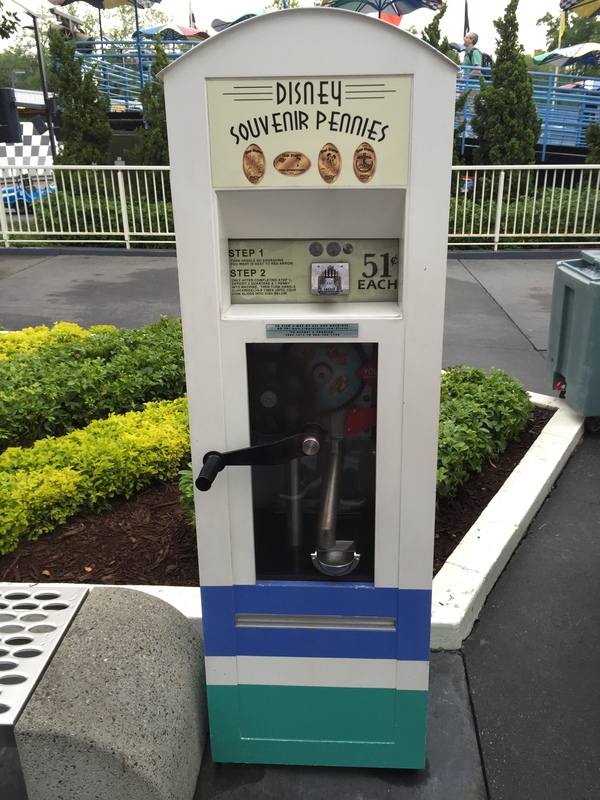 Close to Heritage House there is a back alley type of area near the Fastpass kiosk is where this machine located. One nice thing about this location is there was no one around and plenty of space to spread out and press my coins. There were 3 designs: Liberty Square Riverboat, Hall of Presidents, and Patriot Mickey. By this time we noticed the scotch tape being placed along the walkways and knew a parade was about to begin. We cut along the river area and headed towards Big Thunder Mountain. This is a ride I actually don’t mind but with no Fastpass the standby line was over 100 minutes and we just didn’t want to wait. 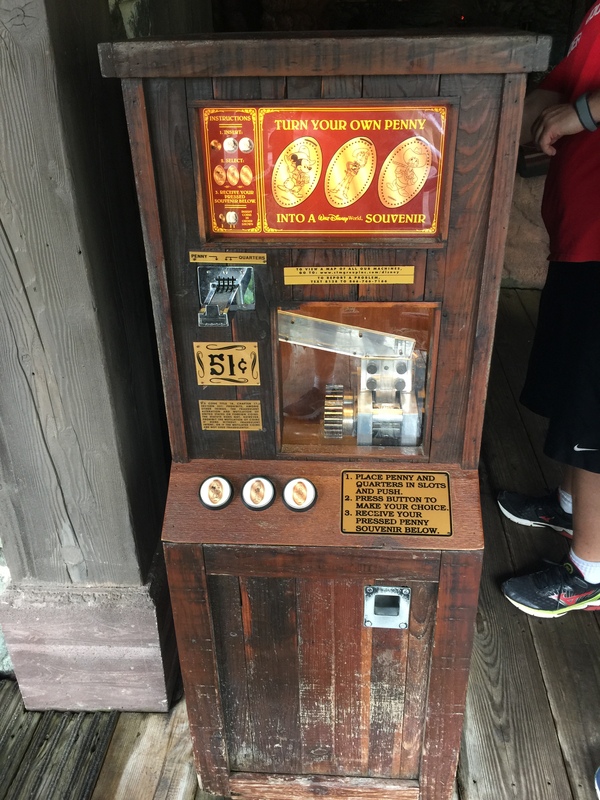 Near the exit to the Huck Finn Raft launch was a 4 design hand crank penny machine. The designs were: Cowgirl Daisy, Cowgirl Minnie, Cowboy Donald and Cowboy Mickey. Next up was Splash Mountain. I was forced to ride this as a child with my sister who loves these types of rides but my wife wasn’t too keen on it so we just stood and watch people come down the big drop. We then walked back behind Splash Mountain past the Frontierland Railroad Station to a gift shop that has 2 machines. One located near the restrooms and the other further back by the Splash Mountain Photo Preview area. Most of the designs are Splash Mountain themed which is cool. The first machine has: Big Thunder Mountain Railroad, 2015 Chip & Dale, and Splash Mountain logo. The second machine included: Mickey and friends riding Splash Mountain, Mickey and Minnie splashing water, and Brer Rabbit and friends on Splash Mountain. By this time we were getting a little tired ourselves and wanted to make sure we had enough time to get back to our resort and rest before heading back into the park to eat. We headed back towards Main Street and towards the exit. 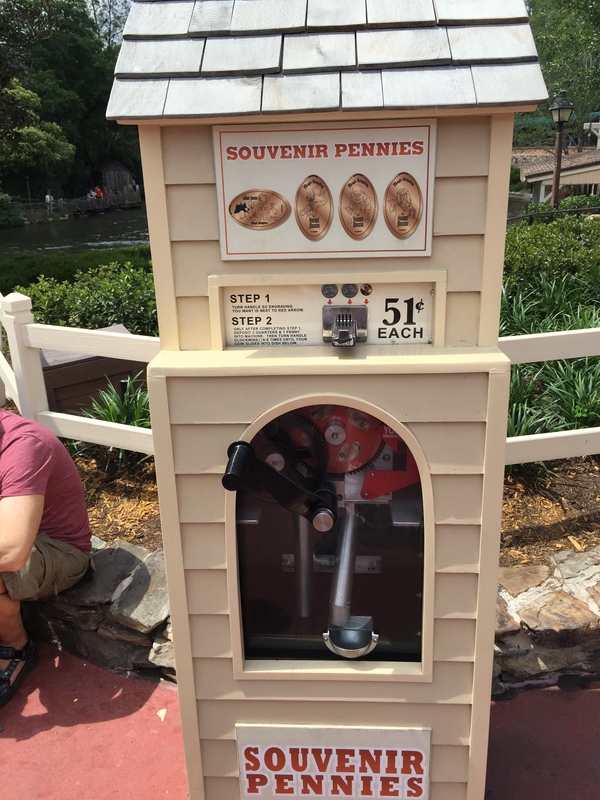 Just after exiting the park there is a Newsstand that had a penny machine. 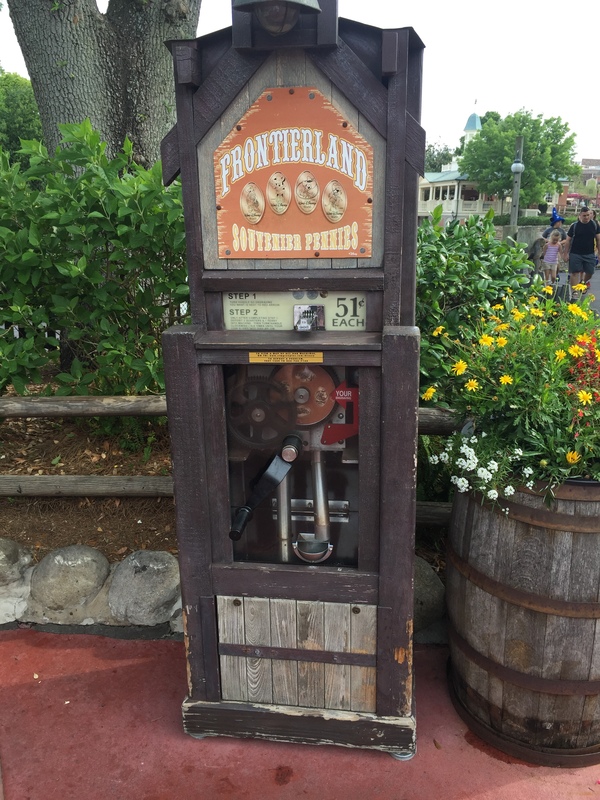 When we first entered the park I tried to use this machine but it was being worked on by a cast member. Luckily when we were leaving it was working perfectly. The designs are: Cinderella, Tinker Bell and Peter Pan. 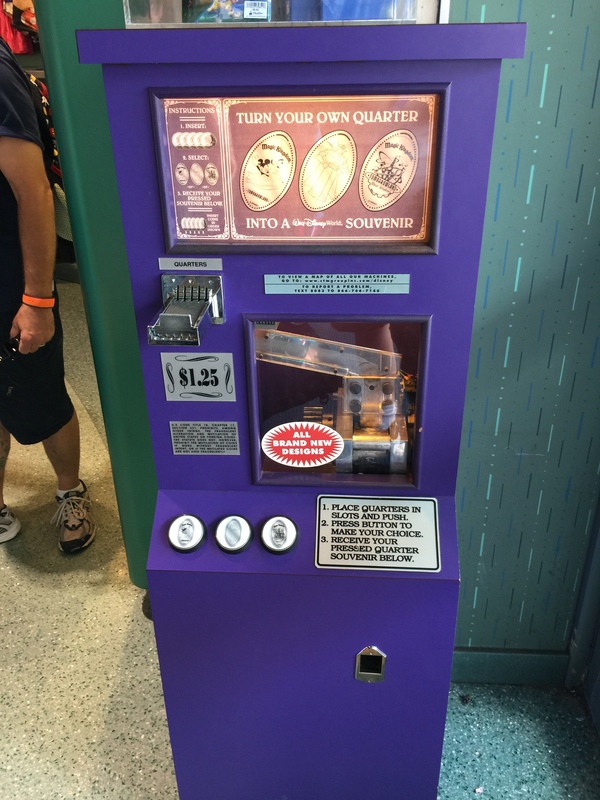 With those coins in hand we then grabbed the monorail one stop to our resort and joins our family for some much needed down time. A couple of hours later the kids were all awake and ready to go. We headed back on the monorail into the Magic Kingdom and didn’t have far to go. Our diner reservations were at Tony’s Town Square which is an Italian restaurant themed after Tony from Lady and the Tramp. This place was packed, and even through we had a reservation still needed to wait about 10 minutes or so, which seems so much longer when you have antsy kids and an empty stomach. I walked Hanna over hear the restrooms where the restaurant had a machine. Hanna helped me press the pennies which included: Lady, Tramp, and the whole Lady & the Tramp gang. We were then seated shortly after and enjoyed our meal. Our service was a little slow but I just attributed that to the place being really busy. Most of my family had the chicken Parmesan which was really tasty, and my wife tried a flatbread pizza which she also really enjoyed. After diner my sister and brother-in-law were ready to check out the park but the kids seems like they wanted to head back to our room. My parents offered to take them back and watch them until it was bed time. We thanked them and were off to check out the Haunted Mansion. This ended up being a great time to go on as the wait was posted as being only 10 minutes. After the Haunted Mansion we went towards Splash Mountain. My brother-in-law was taking my sister on who seemed a little apprehensive in her old age (thanks Karma). They had a Fastpass but it wasn’t available for another hour so they decided to wait for Big Thunder Mountain which was about a 40 minute wait. They said they would text us when they were on Splash Mountain so we could head to the bridge and watch them plummet over the falls. I took my wife’s hand and lead her towards the Frontierland Shooting Arcade but cut through to the Dole Whip sand. She got just the Dole whip cup while I got the float. We sat right along the shooting arcade and just watched everything going on around us while we enjoyed our tasty new treat. My phone eventually buzzed letting us know they were on Splash Mountain so we headed over to watch. Their official picture was another great source of amusement. By this time is was getting late and we figured we should probably head back. As we walked along Main Street we headed into the Emporium to check out some souvenirs. There are 3 machines in the Emporium but I only needed 2 of them. 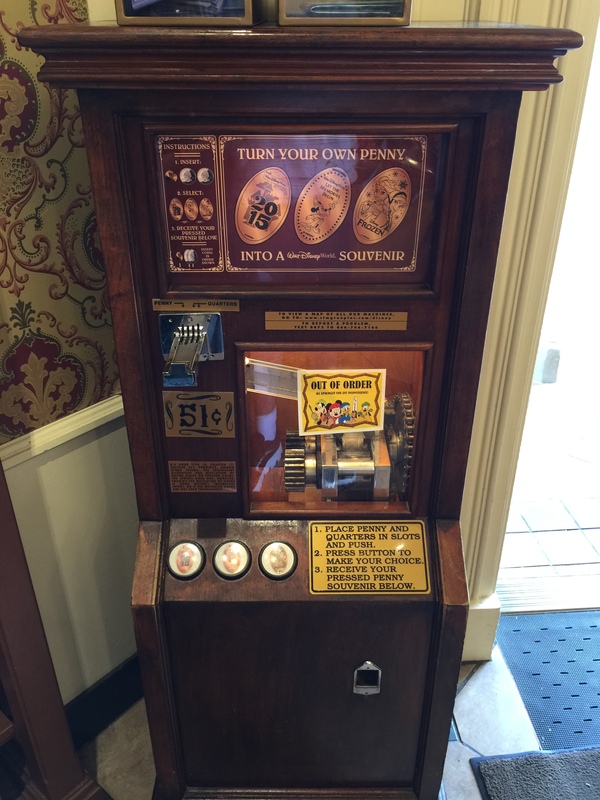 The first machine worked perfectly and had designs of Mickey with a Bow Tie, Cinderella’s Castle, and Minnie Mouse. Unfortunately the second machine was Out of Order. The designs included 2015 Cinderella’s Castle, Let the Memories Begin, and Anna & Elsa from Frozen. In my previous post I mentioned new plaques on some of the machines saying you could text about out-of-order machines. So I sent the text and received a quick confirmation back. I wasn’t going to wait around, but we did have our schedule set to come back into the Magic Kingdom on our last day before heading home. I was able to get these coins during that trip. We paid for a few souvenirs and then headed back to our room for some much needed sleep. It had been a busy day and I was able to visiting all the machines I needed to. With only one machine not available I was pretty happy with the outcome.